Potty training is one of those skills that children will learn when they are good and ready, working to their own schedule and that's just fine. These top tips, hints and ideas for smoothing the transition between nappies and the big boy or girl toilet will hopefully give you some inspiration if you are nearing this fun stage of development! By all means introduce your little one to the idea of a potty or a toilet as early as you like however actually using it should wait until they are ready. Many children don't learn control of their wee or their bowels until they are between 18months and 2 years old. Some learn earlier and some later. There is no set age so you have to take your cue from your little one. Teach your little one the right vocabulary for wee wee or poo (whatever you choose to use in your home) so that explaining the process and what you want them to do is easier for them to understand. 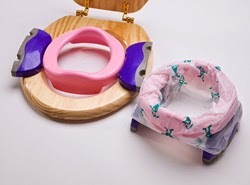 Have a Potty or Toilet Seat Ready Have a potty around and in plain sight so that your little one gets used to have it around before you start encouraging them to use it. Some children are happy with a potty, some want to use a seat on the grown up toilet, it doesn't matter which as long as they are confident and happy. Reward Successes and Don't Worry about Accidents Toilet training is always going to get a little soggy and quite possibly messy. Instead of telling your little one off for accidents tell them and show them what they should have done. When it comes to doing a wee or a poo in the potty (victory at last!) celebrate these successes in style. Incentives Don't try and bribe your little one into using the potty as if they simply aren't ready and are denied their treat it won't go down well. Reward charts and stickers are a great way for these big girls and boys to see how well they are doing and how clever they are. Big boy and girl pants and knickers or pull-ups also do a great job of showing them how grown up they are now. Be Prepared For Mess Sometime there is mess and sometimes there isn't. It might be worthwhile making sure that you have an empty washing basket, extra wipes and extra absorbent kitchen roll or similar for quick and efficient clean ups when you do get started. Toilet Training Away From the Home If you can start the process at home on a week when you have little or no reason to go anywhere this is ideal. This isn't always possible however so make sure that you are prepared. Always carry extra clothing and underpants, bags for putting any messing items in and if you are out and about a travel potty will be a lifesaver for those "Mummy, Daddy I need to go NOW" moments. Above all remember that children are all very different. While one child might have daytime toilet training sorted within a week it might take weeks or months for another. Sometimes you have to accept that they simply aren't ready and it could be best to leave the potty in sight but revisit the idea in a few more weeks or months when you and your little one are more ready. Do you have any fabulous toilet training tips (or stories!) to share? If so we'd love to hear them!